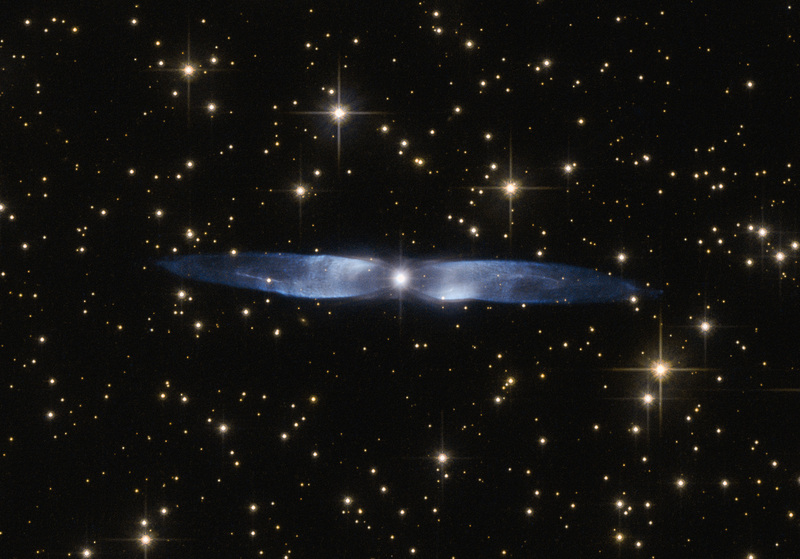 The dual lobes of bipolar planetary nebula and dying star, Hen 2-437 glow in brilliant blue here as seen by Hubble. Planetary nebulae are very low density and comprised of mostly gaseous materials. They range in size depending on the mass of the dying star, composition, speed of material ejection and the amount of time the event has been taking place as well as under what processes it was undergoing while it was being formed. Density in PN’s are so low (Approximately a million atoms per cubic centimeter) that no vacuum on Earth can recreate these conditions. Though planetary nebulae were known about for over 200 years, nobody knew what they were or what their origins were besides the fact that they could look and see them. Inside the core of a star, pressures and temperatures are so great that a process called Thermo Nuclear Fusion can take place. It’s important to remember that stars don’t “burn” as burning is a chemical reaction. Thermo Nuclear Fusion is a nuclear reaction. Hydrogen atoms are being fused together to create helium atoms. When the two nuclei fuse together the combined mass is slightly less than the sum of the original nuclei and the difference is released as energy. As the progenitor star burns through all of its available fuel the star quickly begins to die. The key word here is “available” fuel as most of the hydrogen in a star will never be fused in the core. When this happens gravity begins to win over the outward pressure of the nuclear reaction. The star then begins to crush down onto itself from the extreme inward pressure that gravity is now imposing on it. Ironically enough, this very process of compression causes the core to become super-heated. Core temperatures rise to ten-times the temperature they were while in the main sequence phase. Once the temperature reaches 180,000,000 degrees the temperature will be hot enough to fuse helium into carbon. As this continues, the star will begin to quickly use up its available helium fuel. The massive temperatures cause the star to swell and the asymptotic giant branch aka, the infamous red giant phase begins. Vast layers or shells of gas are then released into the surrounding cosmos creating what’s known as proto-planetary or pre-planetary nebula (PPN’s). The furiously hot star whose inner layers are now exposed radiate massive amounts of ultraviolet radiation rendering the surrounding material aglow and that’s where the planetary nebula (PN) phase begins. When the available helium begins to run dry, gravity once again begins to take over, and again the star is crushed in upon itself; this time down to about the size of the Earth. It is at this point when electron degeneracy pressure is enabled. This means that electrons themselves are being crushed together so tightly that their repulsive pressure on one another will hold the star up. That is where it will remain for billions of years as a white dwarf. Most stars in the universe (about 95%) will end their lives this way; the rest will die as supernovae. WHAT IS IT? : Bipolar planetary nebula. HOW BIG IS IT? : Roughly half a light year across. APPARENT MAGNITUDE: A very dim 15. WHERE IS IT? 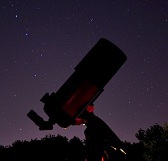 (General): Constellation Vulpecula (The Fox). WHERE IS IT? (Exact RA/Dec J2000): RA 19h 32m 57.56s/ Dec 26° 52′ 43.20″. Image | This entry was posted in Astrophotography (DSOs), Images, Nebula (Planetary) and tagged Astronomy, Astrophotography, ESA, Hubbe, NASA, Nebula, planetary nebula, Science, Space. Bookmark the permalink.